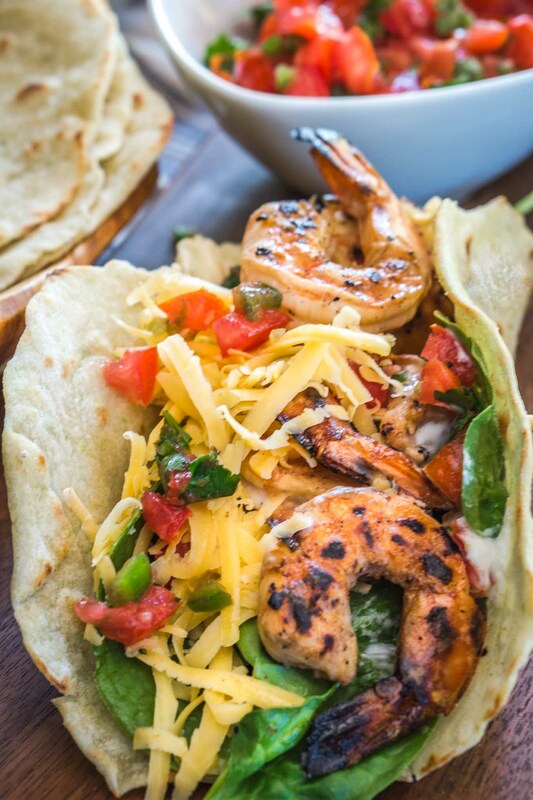 These Raspberry Jalapeno Shrimp Tacos are quick, easy, and absolutely delicious. There’s a hint of sweet followed by a little heat. Best of all, they’re easy on the waistline. How many different taco recipes can there be? Not nearly enough I say! Raspberry Jalapeno Shrimp Tacos are delicious and will be a new regular in our home. I marinated my shrimp. I think that makes a huge difference with some proteins and even veggies! More on that in a future post. 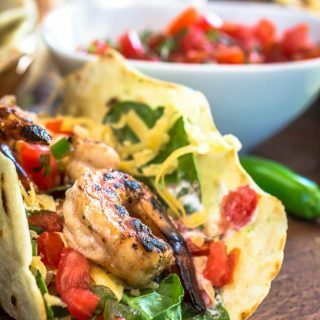 These Raspberry Jalapeno Shrimp Tacos are quick, easy, and absolutely delicious. There is a hint of sweet followed by a little heat. Best of all, they're easy on the waistline. Mix marinade ingredients together. In a separate bowl or zip-close bag, pour enough marinade to just cover cleaned shrimp. Refrigerate and allow shrimp to marinate for at least 30 minutes. Store remaining marinade covered in the refrigerator. While shrimp marinates, soak wooden skewers if grilling. In a small bowl, make pico by combining diced tomato, onion, jalapeno, lime juice, and fresh cilantro and salt. Set aside. In a small container, combine Greek yogurt and lime juice. Refrigerate. Once shrimp have marinated, thread onto skewers and grill. Place on pre-heated grill and cook 3 to 4 minutes on each side. Shrimp can also be sauteed in a skillet or baked. 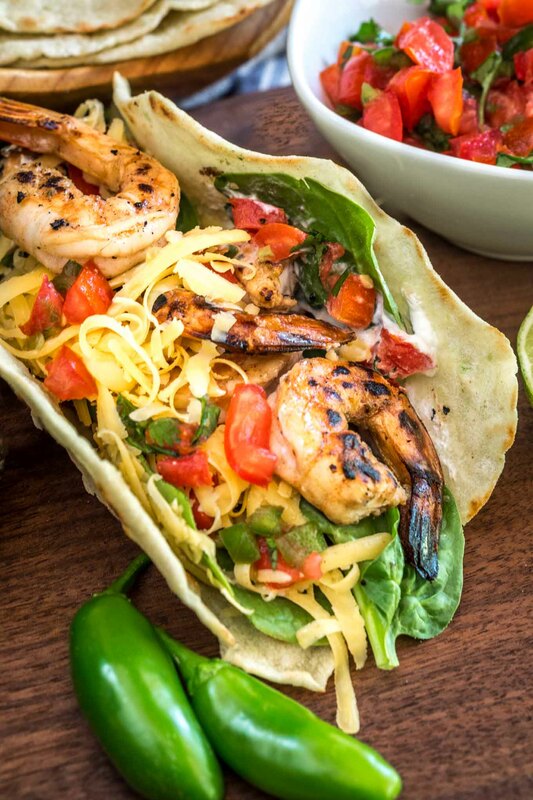 Assemble tacos by adding spinach, shrimp, pico, cheese, and sauce. We also like additional cilantro and fresh avocado on our tacos. 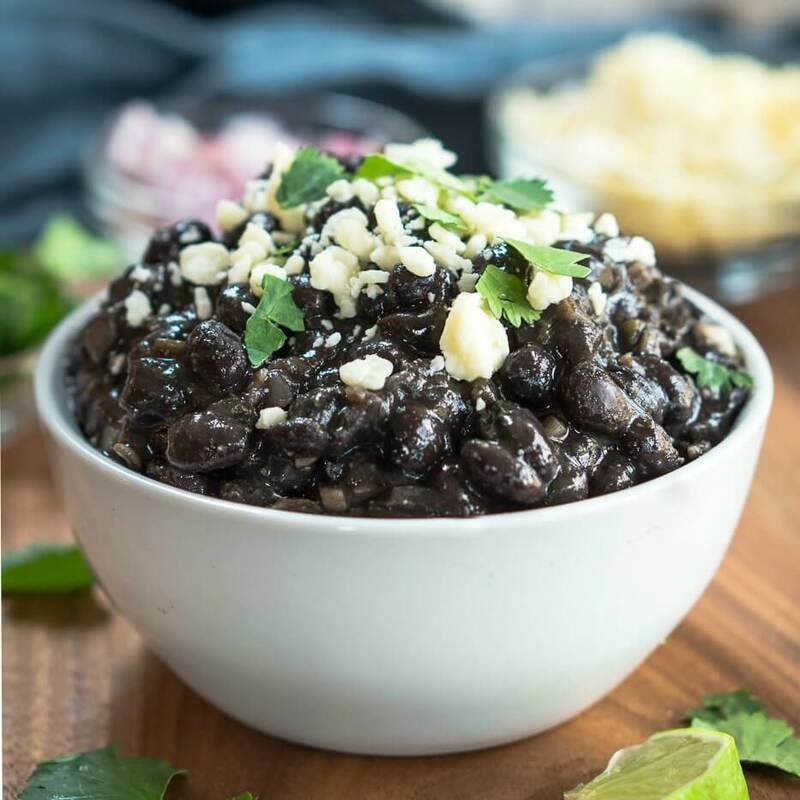 Here are a couple of my favorite Mexican-inspired recipes that I think you’ll love! This looks amazing!! Now I want some tacos! Thank you so much Jessy! I appreciate your sweet comments! I love all the citrus flavours with the sweet and heat. Another great recipe Julie – love it! Yum yum yum Julie!! I am in love with this one. Such a perfect Sat night food…and those shrimps? Gimme now! Thank you Swayam! We just loved these tacos. They just beat anything you can order out and healthy too. Hugs sweetie! Thank you so much Nancy! I appreciate you showcasing them as a feature on FF too! Everything looks wonderful! Look at those shrimp – grilled to perfection and look at those colors! The marinade sounds very interesting – so many flavors. Great pictures! Thank you Ana! We just love shrimp grilled, and I love the way they pick up the flavors of the marinade. Thank you Lili! I appreciate your sweet compliment and love your goodies too! Thank you Julianna! I think we were on the same wave lengths too! These are beautiful! I can taste them already! Thank you Michelle! It is an easy recipe. Having a great weekend and hope you are too. Thank you Michelle! Simple and yummy. I’ve just started playing around with the sweet fruit and chili thing and like what I have made so far. These look really good and give me another to try! I love the sweet spicy thing and for a long time we didn’t mix our “food groups” Glad we do now. Thank you Sarah! Have a wonderful weekend! 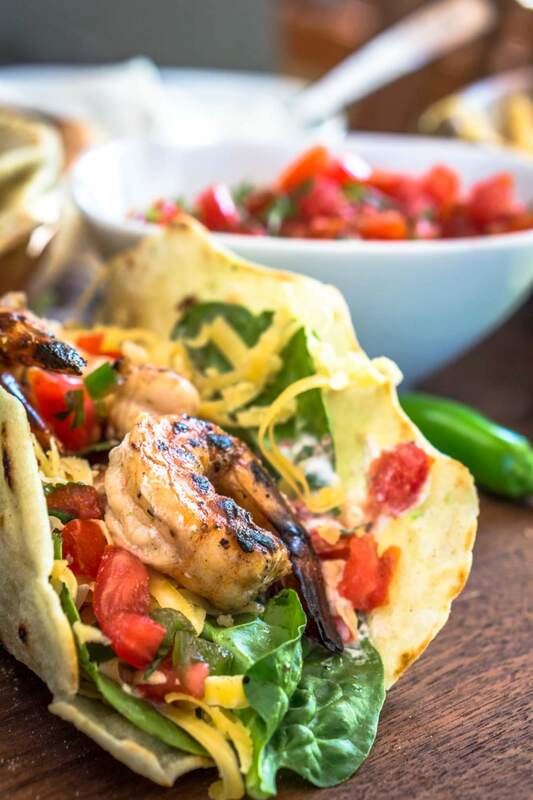 Wish I was at your house eating these for dinner – but knowing you guys they are probably gone already 🙂 Love shrimp and I love tacos, interesting twist with the raspberry jam but I bet just delicious when paired with those jalapenos and your jalapeno tortillas!!! Thank you Judi! You drop by and I’d love to whip some more up for us! John did a great job eating them until they were all gone! Thank you Linda! I’m lucky that John doesn’t mind leftovers! Mmm… your marinade sounds like citrusy berry perfection, Julie! 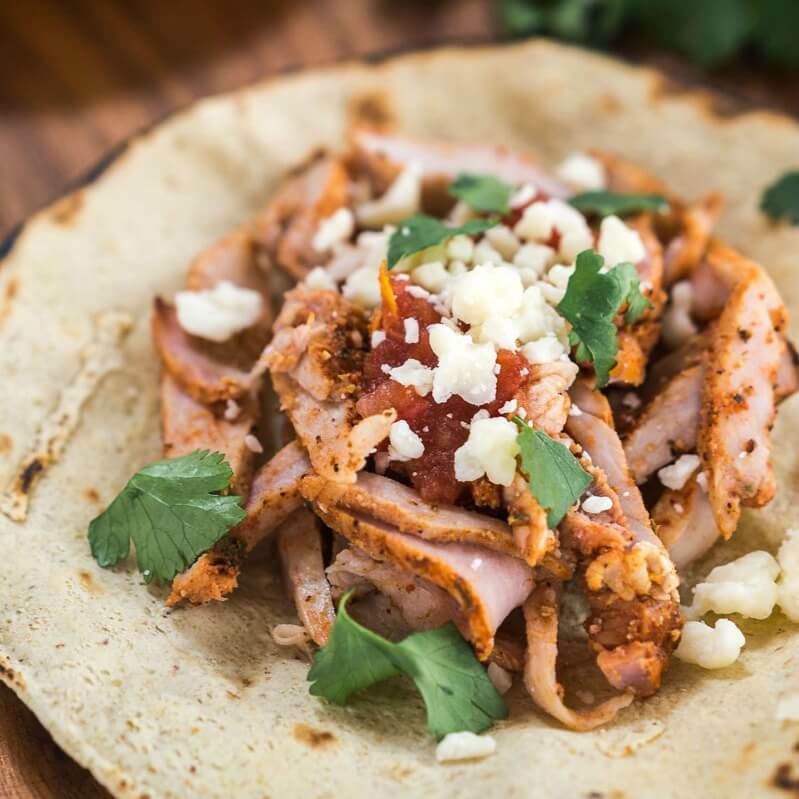 I love everything about these tacos… you’re taunting me again with your fabulous homemade jalapeno tortillas. 😉 And to top it all off… you’re sharing plated perfection… these tacos are pretty to look at as well! Thanks for bringing these tacos to Fiesta Friday… I’m sure they’ll be eaten in no time! Thank you Nancy! We definitely enjoyed them. Thank you so much for co-hosting this week. Have a wonderful time! There are always so many things to choose from for features! You really need a “love” button on your site, Julie! 🙂 Tacos are my 2nd favorite food group (ice cream being the 1st), and these look so unique and delicious. I like that you have so many flavors going on in the marinade. You are right, you can never have enough taco recipes. I can’t wait to make these! Pinning. Thank you Shari! You’re sweet comments really made my day! Very interesting! I’m intrigued by the raspberry jam!!! Thank you Mimi! I just wanted that sweet raspberry flavor and a friend gifted me with his homemade. Oh so summery and colorful Julie, love it! 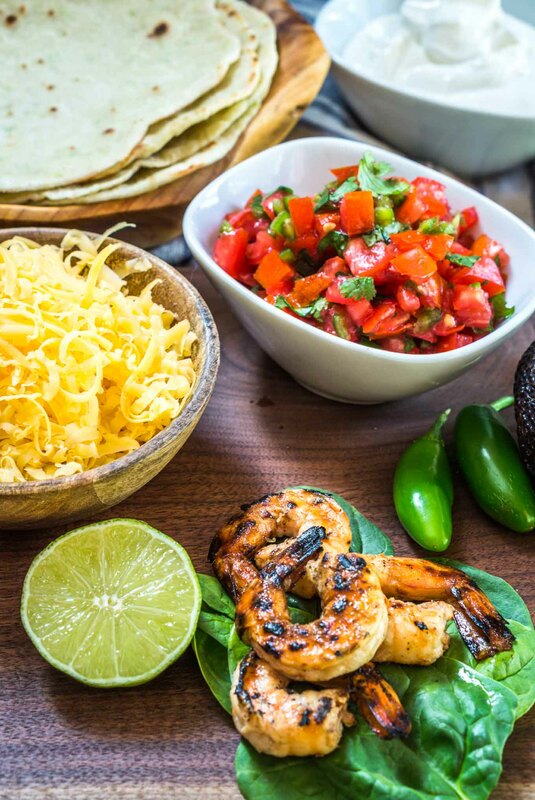 Great that you could put your home-made tortillas to use, the entire presentation looks so yummy. I like the additional photos you’ve presented, they look so crispyand fresh and draws one into the pictures. The secret ingredient of the raspberry jam had to pair well with the jalapenos. Great job! Oh so summery and colorful Julie, love it! 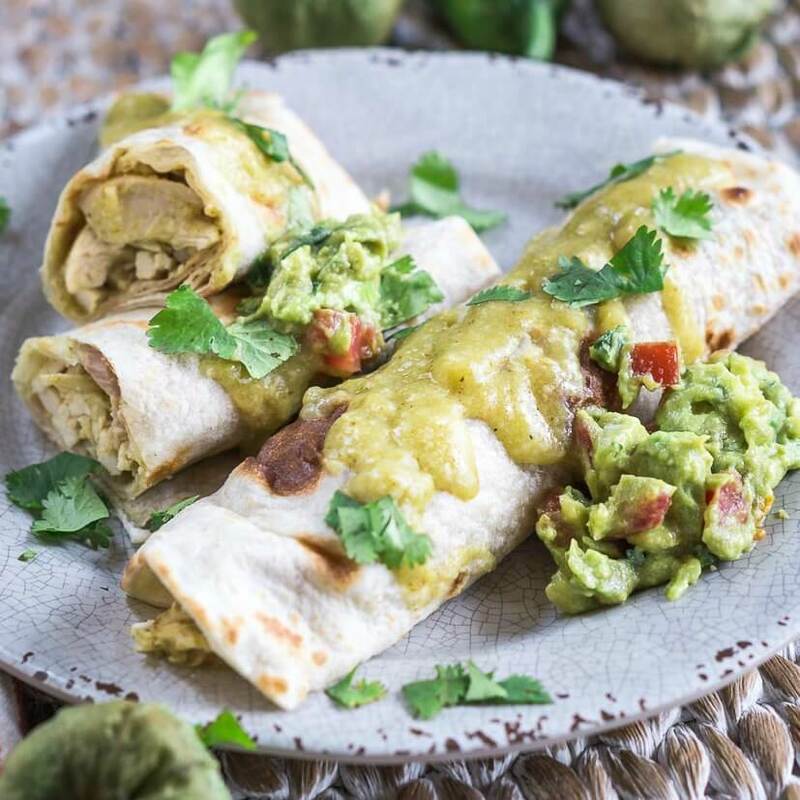 Great that you could put your home-made tortillas to use, the entire presentation looks so yummy. I like the additional photos you’ve presented, they look so crisp and fresh and draws one into the pictures. The secret ingredient of the raspberry jam had to pair well with the jalapenos. Great job! I knew you’d be filling those amazing jalapeno tortillas with something yummy! The cool and sweet raspberries are such a surprising and refreshing choice with the shrinp. When can I come over? I would love having you! Pick up Loretta on the way and we’ll have the best of times!